The Department for Work and Pensions (DWP) is refusing to release evidence that would show how many secret reports it has compiled into the deaths of claimants of its new universal credit, in a fresh breach of freedom of information laws. 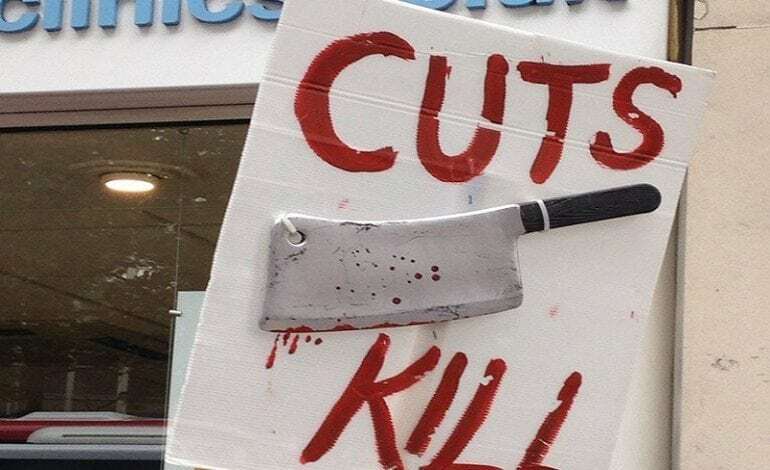 DWP compiles an internal process review every time a “suicide is associated with DWP activity”, as well as in some other cases involving the deaths of disabled or “vulnerable” benefit claimants. The last batch of reviews released by DWP were published in heavily redacted form two years ago. But Disability News Service (DNS) is keen to secure evidence of how many reviews have been carried out since then relating to the introduction of the much-criticised universal credit benefit system. Repeated concerns have been raised about the introduction of universal credit and its impact on claimants in vulnerable situations. Disabled activists have warned that universal credit is “rotten to the core” and have warned of “soaring” rates of sanctions and foodbank use in areas where it has been introduced. In July, employment minister Alok Sharma was asked by MPs on the Commons work and pensions committee why the benefits of hundreds of sick and disabled universal credit claimants were apparently being sanctioned, even though they should not have had to meet any of the strict conditions imposed by the system. In the same month, further concerns were raised by the committee about disabled people with high support needs who claim universal credit and face the possibility of strict conditions – such as being forced to carry out hours of job searches every week – as they wait for a work capability assessment. And MPs on the public accounts committee heard, also in July, how claimants were facing “considerable hardship and considerable deterioration in their mental health” because of universal credit. As a result of earlier concerns about universal credit, DNS submitted a freedom of information request to DWP on 21 June, asking how many internal process reviews had been carried out since April 2016; how many involved a claimant who had died; and how many involved a claimant of universal credit. The request also asked for DWP to release the recommendations made by each review. But DWP’s freedom of information team has failed to respond to the request, and to a follow-up email on 7 August asking why it had not replied, even though it is legally obliged to respond within 20 working days under the Freedom of Information Act. A legal case taken by DNS secured the publication of redacted versions of DWP’s secret reports – then known as peer reviews – for the first time in 2016, thanks to the pro bono legal work of barrister Elizabeth Kelsey, from Monckton Chambers. The information rights tribunal ruled in 2016 that DWP should release recommendations from all the peer reviews it held, although not any information directly related to the people who died. A further batch of redacted reviews into another nine benefit-related deaths was released by DWP later in 2016, following pressure from the Information Commissioner’s Office, but it is believed that no further reports have been released since then. Last week, DNS revealed how DWP had refused to release other secret reports connected with its welfare reforms, this time those written by disabled people who had been recruited as “community partners” to work with its jobcentres. When asked why DWP’s freedom of information team had refused to respond to the internal process review request, a DWP spokeswoman said: “As explained last week, any issues relating to FOI requests can be dealt with by writing to freedom-of-information-request@dwp.gsi.gov.uk. DNS will be lodging a complaint with the information commissioner about DWP’s failure to release the internal process reviews. Mordaunt and her civil servants spent much of the Global Disability Summit last month telling other countries and organisations to sign up to a new Charter for Change. The charter calls on those signing it to “hold ourselves and others to account for the promises we have made here today” and to “strive for real change” through implementation of CRPD. CRPD says (in article four) that governments must, in implementing the convention, “closely consult with and actively involve persons with disabilities… through their representative organizations”. It also says (article 33) that “civil society, in particular persons with disabilities and their representative organizations, shall be involved and participate fully” in monitoring the implementation of the convention in each country. Other members of the UK CRPD Monitoring Coalition of Disabled People’s Organisations include Disability Wales, The Alliance for Inclusive Education, Disabled People Against Cuts, Sisters of Frida, Inclusion Scotland and the Mental Health Resistance Network, several of which are members of the Reclaiming Our Futures Alliance. In her two-paragraph letter to the coalition, Newton says she will not be able to meet with them “due to ongoing diary commitments” but “would be pleased to have my officials do so on my behalf”. It is not the first time that Newton’s commitment to disability rights has been questioned. Last December, she refused to explain why she had apparently failed to attend or organise any events – or even post a message of support on social media – on the UN’s International Day of Persons with Disabilities (IDPD). The coalition’s letter also reminds Newton that she previously stated that she strongly welcomed a meeting to discuss how the government was implementing CRPD. In February, the coalition wrote to the prime minister, Theresa May, to question the lack of progress since the UN committee produced its “damning” report and to ask for a meeting to discuss their concerns. In her response, sent on 25 April, Newton said: “I strongly welcome your proposal of a meeting to discuss how Government is implementing the concluding observations of the Committee for the Convention on the Rights of Persons with Disabilities and planning to work with organisations led by disabled people. DWP had not been able to comment by 1.30pm today (Thursday), after being approached yesterday afternoon. Another former service-user, a disabled woman who used the home’s respite service and was said to have been deeply upset at not being able to visit Greathouse, is also believed to have died since the closure, while as many as five or six former residents have had to be admitted for hospital treatment. In response to the death of the third former resident, a spokeswoman said: “We were sorry to hear this news and our thoughts are with [his] family. “We currently fund the care and support needs of eight people who were previously receiving care services at Greathouse [four residents and four who received respite and day services] and their needs are now being met by other providers. A Deaf chief executive is having to appeal to charity to fund the support he needs to do his job, after the high court decided that a cap the government imposed on Access to Work (AtW) payments did not breach the Equality Act. The Department for Work and Pensions (DWP) set an annual cap of £42,500 on AtW payments in 2015, but later increased it to £57,200 (twice the annual salary) after David Buxton launched a high court challenge, funded by the Equality and Human Rights Commission. Buxton argued that the higher cap on AtW payments – which fund workplace adjustments for disabled people such as support workers and travel costs – still had a disproportionate impact on the job and career prospects of Deaf users of British Sign Language (BSL) and other disabled people with high support needs. He said this placed them at a disadvantage when trying to get into jobs and develop their careers. Now Mr Justice Kerr has ruled that the higher cap did not breach the government’s public sector equality duty and was not “indirectly discriminatory”. He said the cap was not introduced as a cost-cutting measure but “as an intended cost-neutral measure, changing the distribution of available funding but not its overall level”. And he concluded that the higher cap “strikes a balance” between funding more low-level cost awards and the needs of existing high-cost recipients, who must “forego some of the available funds to provide the money to spend on achieving the government’s aims”. But Buxton, chief executive of the London-based disabled people’s organisation Action on Disability, said this week that the court’s ruling means he will now have to seek support from charitable trusts or donors to pay for the BSL interpreters he needs to do his job. Buxton, whose first language is BSL, believes that Deaf people are being “punished” by the government for their high support needs through the “ideologically driven” cap, which was “directly discriminatory towards d/Deaf people”. The cap means he currently only receives enough support to pay for one BSL interpreter for four days a week. He said that this forces him to spend large parts of the week re-arranging his schedule to ensure there is an interpreter in the office when he needs one. He also has to pay for a second interpreter to cover meetings that will last more than an hour, to allow the first interpreter to have the necessary breaks. Evening meetings are an even greater stretch on his AtW support budget as they are more expensive. This means he is frequently left with enough interpreter support for just three days a week, or sometimes just two. And he can never predict when he will receive unexpected phone calls, or if staff will need to see him urgently at short notice. He said: “This cap has caused me a lot of stress and isolation. Some days I don’t have any funds to pay for interpreters, mainly because I booked co-workers on other days, [and because] evening meetings cost more. Buxton said he had worked “so hard for many years” to reach his current position, which he achieved because of his skills and experience, not because he was Deaf or a BSL-user. He said: “The cap has real and lasting effects on my ability to do my job. And he questioned whether such a cap would be appropriate for a minister who used BSL as their first language. He is also concerned that ministers have refused to say how much revenue is returned to the Treasury for every £1 spent on Access to Work, through taxes paid by recipients and their support workers and interpreters and the benefits that ATW-recipients do not need to claim if they are in work. Previous research has suggested a return of as much as £1.48 for every pound spent on AtW. A DWP spokeswoman refused to respond to concerns that the cap meant that disabled people – particularly BSL-users – with high support needs would never be able to achieve full equality. She also refused to say if DWP accepted that the cap was imposing a limit on how far the careers of some Deaf professionals could go, and whether the minister for disabled people would expect a Deaf minister to cope with less than full-time communications support. She also refused to say if DWP had calculated the financial return to the Treasury for every £1 invested in Access to Work. But she said in a statement: “We welcome the high court’s judgment. “We’ve set out a commitment to see one million more disabled people in work by 2027, and Access to Work forms an important part of our plans. “When making changes to Access to Work we work closely with stakeholders from the deaf community, including the UK Council on Deafness as well as deaf individuals. “We’ve decided to increase the limit on the amount people can claim under Access to Work by £15,000 to up to £57,200 a year, and last year 25,000 people had their request approved by Access to Work, an increase of eight per cent from 2015-16. But Louise Whitfield, Buxton’s solicitor, from legal firm Deighton Pierce Glynn, said: “Despite the very real gains of the massively increased cap, it is extremely disappointing that the government failed to recognise the significant adverse impact on Deaf people of preventing them from working in roles that need high levels of support. And the Stop Changes To Access To Work campaign praised Buxton for taking the case and said the ruling “highlights the fragility of our rights protections whereby government can decide to implement measures that discriminate and curtail the equalities of Deaf and disabled people so long as they prove they have considered the impacts and cite funding constraints. The campaign said the judgment showed there was “far more to do in the fight for the rights of Deaf and disabled people to work on an equal basis with others in line with article 27 [on work and employment] of the United Nations Convention on the Rights of Persons with Disabilities”. Inclusive education campaigners have condemned the government’s “woeful” response to a review of the experiences of disabled children and young people in residential special schools. The Alliance for Inclusive Education (ALLFIE) said the government had again failed to take action that would “turn the tide against increased segregated education” and improve inclusive education in mainstream schools. Dame Christine Lenehan, director of the Council for Disabled Children, who co-chaired the independent review, said last November that she had found the quality of support in residential special schools “extremely variable”, while there was “far too little focus” on educational outcomes. Far too often, she said, the disabled children and young people who ended up in residential special schools had been failed by the system. And she called for a system which enabled disabled children to attend schools in their local communities. Dame Christine’s review, which was commissioned by the government, concluded that “experiences and outcomes for these children and young people are too often not as good as they should be”. About 6,000 disabled children and young people are educated in about 330 residential special schools and colleges, in the state, non-maintained and independent sectors, costing about £500 million a year, with each placement costing between £35,000 and £350,000 a year. In his response to the review, education secretary Damian Hinds said in a letter to Dame Christine this week that he recognised there had been “a steady movement of children with special educational needs out of mainstream schools and into specialist provision, alternative provision and home education”, with increasing rates of school exclusions. He said it was “right that the presumption in law is for mainstream education” but that he was also “clear that specialist provision can be the right choice for many of those with more complex needs”. He said he wanted to “equip and incentivise” mainstream schools “to do better” for disabled children and young people, and said the government had begun a review of the national minimum standards for residential special schools. Hinds also pointed out that the government had put in place a contract with the Whole School SEND Consortium – worth £3.4 million over two years – to “embed SEND [special educational needs and disabilities] within approaches to school improvement in order to equip the workforce to deliver high quality teaching across all types of SEN”. But ALLFIE said it was “very disappointed by the government’s lack of action to eradicate residential and day special schools and continued failure to turn the tide against increased segregated education, resulting in too little being done to improve inclusive education practice”. It pointed to the comments of the UN’s committee on the rights of persons with disabilities last September – in its “concluding observations” on the UK’s progress in implementing the disability convention – in which it said it was concerned about “the persistence of a dual education system that segregates children with disabilities in special schools”. The committee called for “a coherent and adequately financed strategy… on increasing and improving inclusive education”. The UN has separately made it clear that inclusive education means that all disabled children and young people are educated in mainstream settings and that the right for disabled students not to be discriminated against “includes the right not to be segregated” into special schools. ALLFIE said the contract awarded to the Whole School SEND Consortium was a “distraction” from the findings in Dame Christine’s report that £500 million was spent supporting just 6,000 disabled young people in residential special schools every year – an average of about £80,000 per pupil – while mainstream schools were facing “substantial cuts” to their budgets. It said that the suggestion by Hinds that parents “actively make a choice” of specialist provision was not based on evidence, with Dame Christine finding that “many of the children and young people currently in residential special schools and colleges could be educated in their local communities if better support was available”.